If you like your games intelligent, distinctive and inventive, Dishonored 2 should fit the bill. Following 2016's cataclysmically misguided protest-votes against the direction of 21st-century politics, many people's thoughts have turned to the prospect of living in an authoritarian dystopia. So Dishonored 2's arrival could not have been more timely. 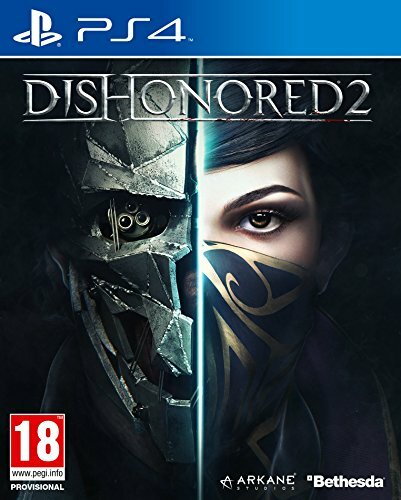 Like the 2012 original, Dishonored 2 is a stealth-action game set in a steampunk game-world where swarms of armed guards, military robots and low-life gangs patrol the streets, while a privileged elite inflicts maximum cruelty on the masses. The perfect fantasy-world, then, to immerse yourself in so as to escape the real world? Is Dishonored 2 a stealth game? As with the original game, Dishonored 2 demands a caveat: while it sets much store by allowing you to adopt whatever play-style you choose, its rigorous artificial intelligence systems render it pretty unforgiving, and if you don't have the patience for stealth games, you'll find it frustrating. But if you liked the original game, you'll love Dishonored 2, as it very much picks up where Dishonored left off: so much so that those who demand gameplay they have never before experienced will undoubtedly carp that it's too similar to the original game. However, this time around, its complex systems mesh so seamlessly that they gel into a whole which is disturbingly believable. Dishonored 2 is only a refinement of the first game, but every aspect of it has been refined to near-perfection. The action starts 15 years after the events chronicled in Dishonored, with Emily Kaldwin – daughter of Empress Jessamine Kaldwin who was murdered at the start of the first game – installed as Empress, and reluctantly attending a state occasion to mark her mother's murder. Emily's popularity has plummeted, however, due mainly to the suspicious murders of her most outspoken critics, at the hand of someone known as the Crown Killer. At the ceremony, a full-blown coup takes place, with someone calling herself Delilah Kaldwin, supposedly Emily's older half-sister, assuming the throne, backed-up by some very impressive magic. At the pivotal point of the coup, you must make a big decision: whether to play as Emily or her father Corvo Attano (the protagonist of Dishonored). In general, Emily is more mobile than Corvo but packs a lesser punch in combat, so is better suited to a stealthier play-style. The main difference between the two lies in their magical powers. Although Emily has equivalent to some of Corvo's most fundamental powers – Far Reach is her equivalent of Corvo's short-teleport Blink move, and they share most of the powers which buff attributes like agility and strength – Emily has pretty flashy powers of her own, such as the ability to create a doppelganger and summon a swarm of rats. Where is Dishonored 2 set? Escaping the palace, you follow a lead to Dunwall's docks and meet up with Meagan Foster, a ship's captain who has been working with Anton Sokolov, genius inventor and friend of Corvo Attano. The pair head to Karnaca, a port city on the southern island of Serkonos. Karnaca plays a starring role in the game: it is brilliantly realised, with more of a Mediterranean vibe than Dunwall (from the original game), but with just as much hostility towards the unwelcome: the areas which aren't patrolled by guards or Clockwork Soldiers are in the hands of petty criminals called Howlers. While Dishonored's rat-plague has abated, a new epidemic has taken root in the form of Bloodflies, which are nasty, venomous bird-sized insects that have caused numerous buildings to be abandoned. What really makes Karnaca a fine place in which to spend your virtual time is that, despite its overtly oppressive nature, it manages to be a bustling, vibrant place, whose population never mills around gratuitously – a common failing of open-world cities in videogames – but appears to be going about life in a plausible manner. As with Dunwall, the environmental design is absolutely stunning: developer Arkane Studios has really gone to town with the steampunk vibe and you can find elevated and underground routes to just about anywhere. How difficult is Dishonored 2? Few games give you as many excuses to explore as Dishonored 2. As per the first game, you're given a heart which pinpoints Runes, which allow you to acquire new powers and upgrade existing ones; and Bonecharms, which provide extremely handy perks, such as faster swordsmanship or brief invisibility after you perform a choke-takedown. You can find side-missions which, on completion, slightly ease your path through the next main mission, and you can stock up on useful items in black market shops. Gameplay-wise, Dishonored 2 is more or less identical to its predecessor, in that you're trying to progress small distances through the city or various buildings, in the face of large amounts of enemies and obstacles which are essentially puzzles to be solved. Some of those puzzles are top-notch: for example, the Clockwork Mansion, home to the evil Kirin Jindosh, who is assembling an army of Clockwork Soldiers for Delilah Kaldwin, is dotted with levers which reconfigure its interior. Even gaining entry to the building requires a fair bit of initiative, and reaching the specific parts of it in which you will find your targets involves plenty of head-scratching and a large number of assassinations. As in Hitman, Dishonored 2 more or less forces you to get to know its environments incredibly intimately. It's possible to play Dishonored 2 without taking a stealthy approach, but majoring on combat throws up extra challenges. At the end of each mission, you're given a Chaos score, according to how many enemies you killed; if you left a lot of dead bodies in your wake, the game-world will become more chaotic as a result, with extra Bloodfly infestations and more guards. What weapons and magic are in Dishonored 2? There's some great weaponry in the game, as well as some which is disappointingly weedy: you get a sword in your right hand, a pistol in your left, and a great crossbow which can be equipped with incendiary rounds and sleep-darts. But the grenades, claymores and mines are disappointingly clunky to deploy, and don't pack that much of a punch. Noise plays a huge part in your progress – as soon as you engage in a sword-fight, for example, any guards within earshot will come running, and you will quickly find yourself beset. Running and hiding can be a valid tactic. But focusing on improving your combat-oriented powers considerably evens the playing field. We found the stealth approach more satisfying, however. If we were to highlight areas in which Dishonored 2 falls short, we would point at its graphics which, despite the superb art-direction, feel a bit muddy and lacking in crispness compared to those of recent games. There were a couple of occasions when we got stuck due to the lack of a particular power: so it's vital to perform manual saves frequently and to preserve some older ones so you can rewind and reshape your character if needs be. Essentially, in such circumstances, Dishonored 2 punishes you for skimping on the exploration, and it would be nice if you could reclaim your Runes and rearrange your loadout of powers. If what you seek from a game is a palpable air of intelligence, bags of character, a gloriously baroque storyline populated by deliciously venal characters and the chance to play in whatever style you see fit, you'll love Dishonored 2. Although it's single-player only, it's still extremely meaty – speed-runners could possibly play through in 12 hours, but you're more likely to spend 20 hours if you put in a reasonable amount of exploration. There will always be areas which escaped your scrutiny too. So, along with the ability to choose between two characters and wildly differing play-styles, it achieves levels of replayability seldom seen in a videogame. Dishonored 2 may only be a refinement of its 2012 predecessor, but it's a damn fine refinement that achieves near perfection. Indeed, it's one of the finest games money can buy in 2016.